Before Charles Xavier (James McAvoy) and Erik Lehnssher (Michael Fassbender) became Professor X and Magneto, they were two young men discovering their mutant powers. “X-Men: First Class” unveils the beginning of the X-Men saga. As the first class discovers and comes into terms with their formidable powers, alliances are formed that will shape the eternal war between the heroes and villains of the X-Men universe. After Charles and Erik recruits the first class of young mutants, these gifted students learn to control and direct their powers for the greater good of mankind. But harnessing these powers is not easy nor is their coming together as a team. You can read more about the upcoming "X-Men: First Class" after the break. In the first X-Men film trilogy, the mutants have long honed their abilities and were a smooth-running team. But when we meet the young mutants in “X-Men: First Class”, their powers are untamed and unfocused. Like most teenagers, the mutants are uncomfortable with being different from their peers. Charles’ first mutant ally is Raven, a blue-skinned shape-shifter with superhuman agility. The two mutants had met as youngsters when Charles discovered Raven rummaging through the kitchen of his family’s mansion. Charles makes Raven a member of his family, and they grow up as a kind of brother and sister. But as we know from the first films, their relationship will change dramatically. Explains Bryan Singer: “Because Charles is young and at times naïve, he sometimes doesn’t pay as much attention to Raven as he should, and she sometimes becomes resentful. And that takes her on the path to where we find her in the original film trilogy as part of Magneto’s Brotherhood”. Jennifer Lawrence portrays Raven, whose mutant name is Mystique. As Charles and Erik become aware of the existence of other mutants, they discover a plot that puts them in the middle of the escalating tensions between the U.S. and the Soviet Union. This creates an uneasy alliance between the mutants and a covert U.S. government agency. At the agency, Charles and Erik meet Hank, a brilliant scientist with only a few mutant features until a serum unexpectedly unleashes the superhuman Beast within. Hank works at the top-secret agency developing world-changing technology. Hank has been alone for much of his life in hiding and embarrassed by his big simian-like feet and superhuman agility. When he meets Charles and Erik, Hank’s life takes an unexpected turn. Rounding out the first class are Lucas Till as Alex Summers, a.k.a. Havok who can emit concentric rings of super-heated energy waves causing his targets to burst into flame, and Caleb Landry Jones as Sean Cassidy, a.k.a. Banshee whose unique sonic blasts carry him into flight. 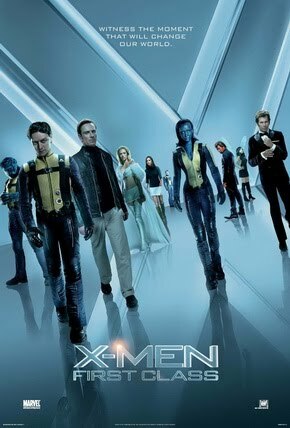 “X-Men: First Class” opens June 2, 2011 (Thursday) in Philippine theaters. The film is from 20th Century Fox to be distributed by Warner Bros.